Grady Myers was a teenager in 1968 when the U. S. Army ignored his extreme nearsightedness, drafted him, and made him an M-60 machine gunner with the 4th Infantry Division. He was trained at Fort Lewis near Tacoma, Washington. This book is beautifully illustrated by Myers, who had a post-war career as an artist for newspapers, including the Spokesman Review in Spokane, Washington. Myers, who studied at the Burnley School for Professional Art in Seattle, died at the age of 61 in 2011. Myers does a fine job evoking the insanity of his war in Vietnam. His co-author, Julie Titone, works at Washington State University and was married for a time to Myers. Myers was awarded the Purple Heart for wounds he received in the Plei Trap Valley in 1969 in an ambush. The high point of this lucid, well-told memoir is Myers’s sober and dispassionate recounting of that near-death experience, the months of rehabilitation that followed, and the surgeries he underwent due to the serious damage done to his body by the bullet wounds he took from short range from the NVA soldiers who were standing over him. Boocoo Dinky Dow is infused with humor throughout, which makes this book a lot of fun to read, even the most gruesome sections. To his credit, Myers hits the various high spots of the Vietnam War’s special characteristics: John Wayne, Sergeant Rock, Tarzan, Gary Cooper, ice cream, mad minutes, ham and mother fuckers, rear echelon types who steal the best stuff before it can get to the grunts, Donut Dollies, leeches, blivets—he gets it all in. 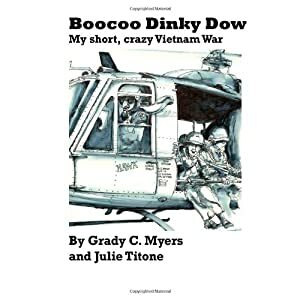 Titone tells us that Grady (known as “Hoss” in Vietnam because of his great size) never was able to attend Charlie Company reunions because “health problems confined him to a wheelchair and, eventually to a nursing home.” We also are told that Myers was well-acquainted with depression. The book includes many specifics about his showering and dunking himself in whatever water he had access to. I believe that Hoss was much exposed to Agent Orange and died from Agent Orange-related causes, although I admit that this is conjecture based on a close reading of the book. Bookcoo Dinky Dow is a fine memorial to the life and service of a larger- than-life man, Grady “Hoss” Myers—teenage soldier, artist , husband, and father, and a great lover of classic automobiles. I miss him and I never met him.